Huawei has made some pretty solid advances this year, whether it is in the flagship segment or the mid-range segment. The Huawei sub-brand, Honor has taken the same path and has made many launches this year. Whether it is the flagship Honor 10 or the mid-range Honor Play, both the phones come off as excellent contenders for the top spot in their respective price range. Right now, to follow up with the success of the top-end Honor 10, the Huawei sub-brand has launched the toned-down version of the Honor 10, the Honor 10 Lite in China. This new phone by Honor comes with a dual rear camera setup, the signature Honor gradient colour, all glass design and a tiny notch on top. Read ahead to know more about what the new Honor 10 Lite packs. Talking about the screen, the Honor 10 Lite sports a 6.21-inch IPS LCD with 1080 x 2340 pixels, Full HD+ resolution on an aspect ratio of 19.5:9. Also, we get to see the waterdrop notch design on the Honor 10 Lite which helps the phone in attaining an impressive 90% screen-to-body ratio. Under the hood, the Honor 10 Lite rocks the Huawei’s in-house manufactured 12nm Kirin 710 octa-core processor clocking up to 2.2 GHz frequency. The processor comes paired with an ARM Mali-G51 MP4 GPU for graphics. 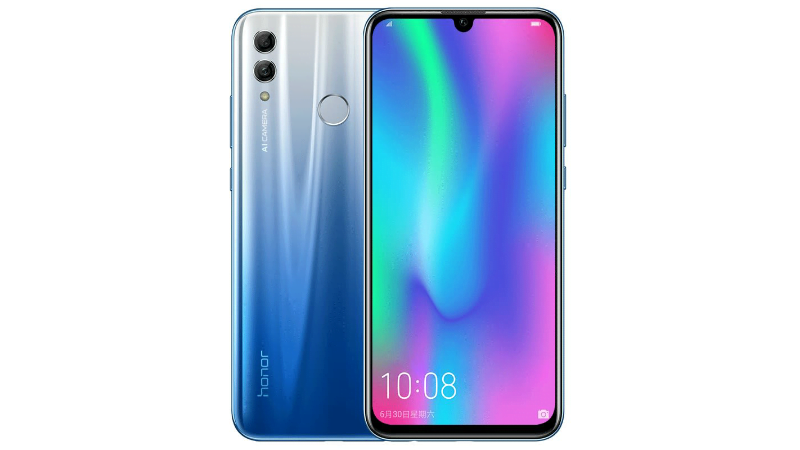 Like the Honor Play, this phone also comes with the GPU Turbo Technology which boosts the graphics and overall performance of the phone to improve efficiency and performance. On the software front, the Honor 10 Lite becomes the second smartphone to come with Android 9 Pie out of the box, with the EMUI 9.0 running on top of it. As for memory, the Honor 10 Lite debuts in three configurations consisting of 4GB RAM and 64GB storage, 6GB RAM and 64GB storage, and 6GB RAM and 128GB storage. If users want to expand the storage, then there is also a microSD card slot which will allow the users to expand up to 256GB. Being a mid-range phone, the Honor 10 Lite doesn’t compare to the Honor 10 in optics and it sports a dual rear camera setup comprising of 13MP primary sensor paired with a 2MP secondary sensor. There is also a 24MP selfie snapper on the front. The 13MP primary sensor flaunts a f/1.8 aperture and supports many AI-powered features like the AI Portrait Mode and AI scene detection. The 24MP selfie shooter boasts of a f/2.0 aperture and offers features like AI beautification and AI portrait mode. For Connectivity, the Honor 10 Lite comes with Wi-Fi 802.11 a/b/g/n/ac dual-band, GLONASS, Bluetooth 4.2 Low Energy, GPS with A-GPS, and Dual 4G VoLTE. Also, unlike the Honor 10 which comes with a USB Type-C, the Honor 10 Lite only comes with a micro USB port. The phone packs a 3,400mAh battery, and we get to notice a rear-mounted fingerprint sensor. The dimensions of the Honor 10 Lite measure 154.8 x 73.64 x 7.95mm and it weighs 162 grams. With the China release of the phone, the company has also opened pre-orders for the device, and it will go live on sale starting tomorrow, i.e. November 22nd. The entry-level variant of the Honor 10 Lite with 4GB of RAM and 64GB of internal storage will bear a price tag of 1,399 yuan (about Rs 14,300) in China. Whereas, the 6GB RAM and 64GB variant will retail at 1,699 yuan (about Rs 17,400), while the top model of the phone with 6GB RAM and 128GB storage variant will come for 1,899 yuan (about Rs 19,500). Also, buyers in China will have four colour options to choose from for the Honor 10 Lite, which will include Midnight Black, White, Gradient Blue and Gradient Red.